Imelda, originally uploaded by carbonator. so last night I sat like gorgonized prey in front of the television watching Ramona Diaz's landmark film Imelda. it aired on PBS independent lens series and it was the first time any Filipinos (outside of the first 1986 People Power days) got in-depth American TV exposure. it was surreal just to see this monstrous medusa morphed into such a human being. she could have been one of my rich aunties at home in the provinces ordering her maids around the house. 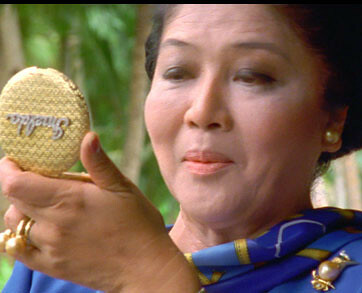 Imelda's true power is her ability to charm and disarm anybody, even herself as she stares at her gold compact mirror. kudos to film maker Ramona Diaz even though I would have wanted a little more concrete details on the sufferings and deaths Imelda did inflict on thousands of Filipinos.